I was thinking about what makes good cities work effectively, and it occurred to me that a prime example is the Restaurant Tram. 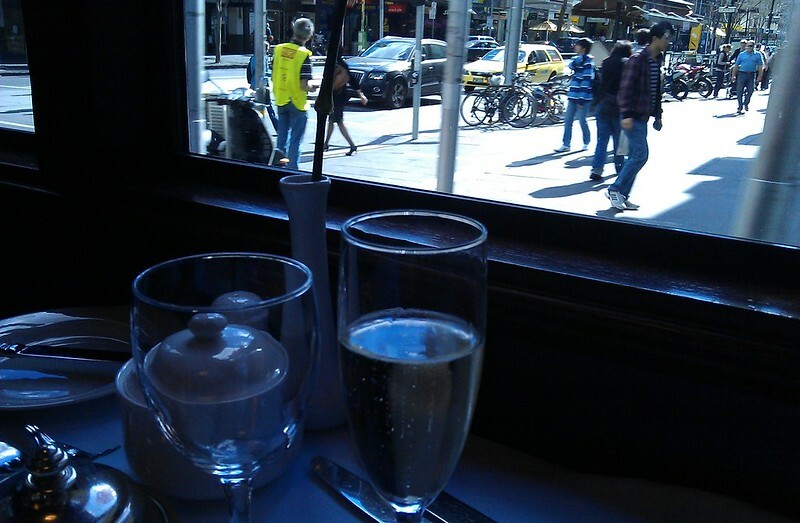 That day we took the Restaurant Tram, we made our way from the train at Southern Cross Station to the pick-up point next to Clarendon Street. The convention centre (Jeff’s Shed) was busy with some expo or other. Throngs were heading in and out of the Casino. We rolled along Bourke Street through the centre of town, then up past Parliament, back along Latrobe and William Street, the streets were busy with Saturday afternoon shoppers. But you can see the restaurant trams gliding through the City every day of the week. On any day in central Melbourne, some people are working. Some people are shopping. Some people are studying. Some are visiting, eating, and doing a mix of all these things and more. The tram of course uses the tram lanes, so it doesn’t block motor traffic. While it moves slower, it doesn’t need to serve each stop, so overall speed is about the same as service trams — so it doesn’t block them either. Thus we have a luxury eating establishment moving through the busiest part of one of the world’s biggest cities, without causing conflict with the myriad of activities happening around it. It’s successful because the demographic exists in Melbourne (either resident or visiting) to support it. It’s also successful because it travels through busy streets, so the diners can people-watch. It could only be successful in a busy city. Likewise, thousands of people converge on the city centre every day, co-operating, collaborating, and doing their thing without blocking others. This is the formula to economic prosperity. The key to a successful city is that completely diverse activities can coexist in close proximity. And it’s also why efficient transport systems are so important. Trains, trams, buses, bicycles, all bring people in and move them around efficiently by minimising the space each person takes as they move. Cars… not so much. They take up too much space per person (and often block the more efficient modes) and have to be stored close to where the person is going. I wouldn’t ban them outright, but the more that can be done to encourage the most efficient modes in the busiest parts of Melbourne, the more that everybody is able to get on with their thing and stay out of everybody else’s way, the more prosperous our city will be. There is a touch of irony in your post today. 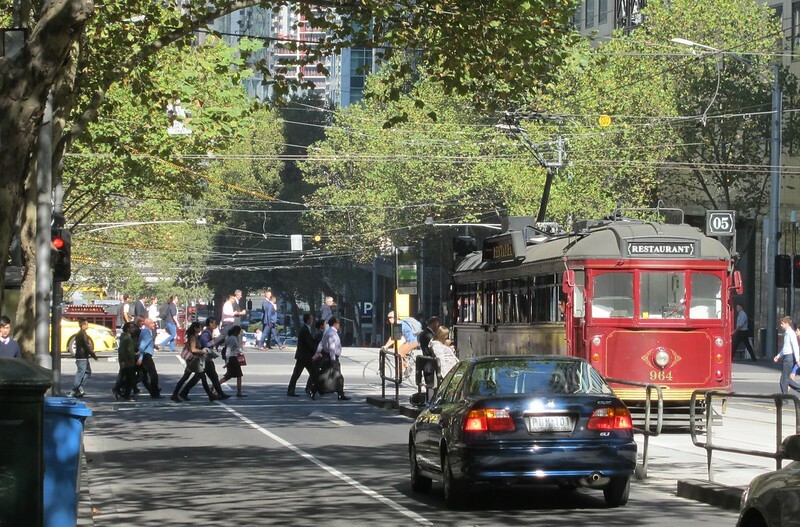 The restaurant tram is taking up space in Melbourne’s busy CBD streets (competing with other trams, cars, cyclists and pedestrians) when it is not actually conveying people who need to get from A to B. So one could argue that it does not have a legitimate right to use that space. That said, there are only one or two such trams operating twice a day so it makes stuff all difference in reality. The streets aren’t just there to move people ‘from A to B’. They’re part of the city and they are useful for moving people and goods between locations, but they’re also there for recreation (which the restaurant tram customers are doing) and running businesses (which the restaurant tram, the other trams, the buses, the couriers, the taxis and most other vehicles are doing). They are legitimately using the space and, as Daniel pointed out, they are not delaying anyone. They certainly cause less of a delay than normal trams because they don’t stop at tram stops. @Philip. I stand corrected. The transport system is also about moving goods as well as people. 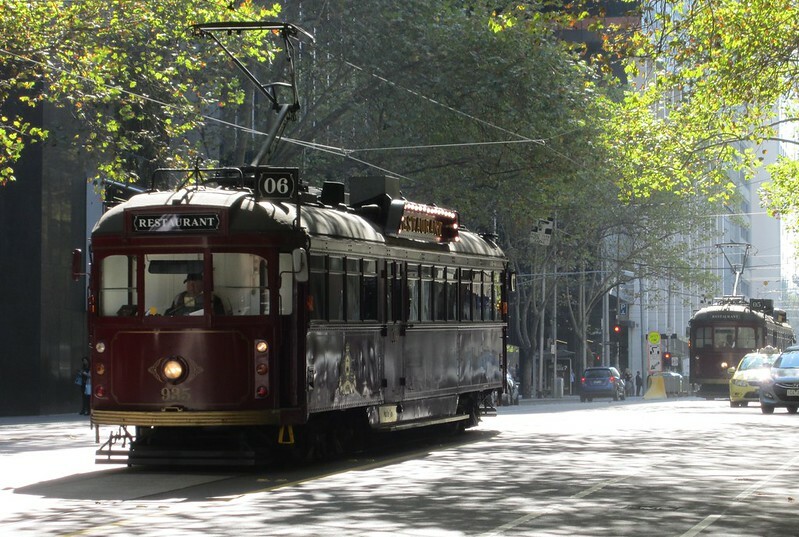 All the examples you give, apart from the restaurant tram, are about moving people and goods – exactly what transport network should be used for. I’m afraid the restaurant trams do delay normal trams at times, but not as much as they did in the first few years after they were introduced. When in Europe and in London and I Sydney, I deliberately observed intersections on very busy roads, and I think Melbourne can very safely claim to the be the world capital for motorists blocking intersections to other vehicles and pedestrians. Other example of uses of street/footpath space include al fresco dining, stalls (such as newspapers/snacks/flowers), public phones, trees for shelter and decoration, benches for resting… Most would agree that these are legitimate uses of the space. Yep, the only reason we think of streets as being about transport is because cars take up way too much space for the streets to be used for anything else. But how much happens on Bourke St Mall, Degraves St or the (privately-managed) streets of a suburban shopping centre! “Transport” is a car-centric idea, if that’s the question you’re asking you’ll probably find “car” is a reasonable answer. In any case, I reckon your average car driver is more of an imposition on the street and delays “transport” by much more than the restaurant trams. The ghost town claims are rubbish. This is not the 1980s any-more, there are things that happen in the CBD on public holidays (although even a public holiday would not have rendered ALF Grand Final Parades a failure in the 1980s). SWanston St is a good place for the parade. It has excellent PT access. St Kilda Road, a suggested alternative venue for the parade, also has almost as good PT access. It would be a disaster if it was moved to a location with poor PT access. Adelaide had a restaurant tram years ago but sadly it was a failure – then again with 99% of our network ripped up in the 60s it’s not like it had the wonderful route it could have had. Next time I’m in Melbourne I must make it a point to enjoy yours. Precisely why we should be encouraging even more people to use public transport. The free tram zone has really got things moving and integrated in the CBD.